The Full-Ramp Guzzler is durable, affordable and the #1 choice for CRP programs. 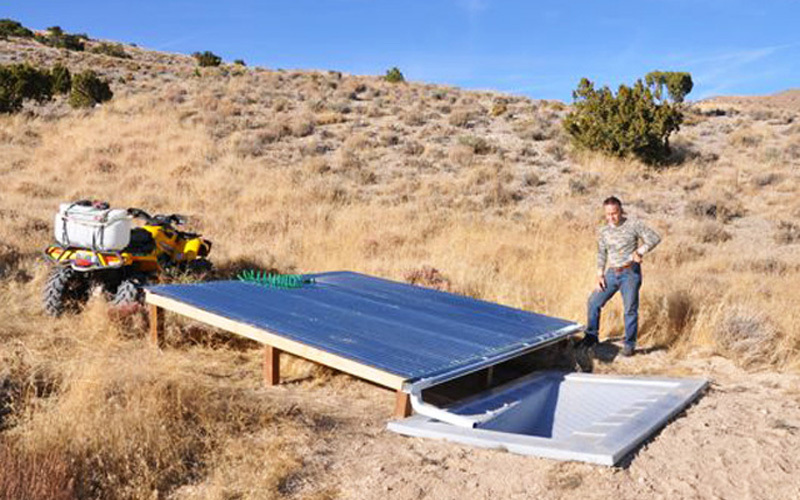 The wide, diamond textured, 26-degree ramp is designed to give upland birds easy access in and out of the drinker. If you want to specifically provide water to upland bird, this model guzzler provides the greatest benefit. A recent Texas study* of the Lesser Prairie-Chicken found that the full-ramp design was “especially beneficial” to hens and broods. And there was a “substantial difference” in frequency of use, (four times) of a full-ramp configuration. The Full Ramp guzzler is made of LLDPE polyethylene and contains no fiberglass. It is easy to handle without gloves and will not crack. It is freeze tolerant so you do not need to drain Rainmaker Guzzlers during the winter. Transporting is simple. Multiple units will easily fit into the back of a standard pickup. Sand granite color. Fittings – We can add fittings for water line-in and drain plug. Generally at no cost. Please take precautions to keep cattle and large animals out of guzzler. Rainmakers guzzlers are made of durable polyethylene. It is 5 times more impact resistant than fiberglass, non-toxic and 100% recyclable. UV inhibitors are added to ensure long outdoor life. PE can handle freezing and sub-zero temperatures. It is commonly used for agriculture tanks and kayaks. It is literally the perfect material for wildlife guzzlers. View Material Spec Sheet. At Left: Full Ramp water guzzler in northern Utah, with a side roof added to maximize rain collection. If you plan to connect your guzzler to a water line, you may want to consider adding a Float-Valve. We’ve chosen this PVC valve with stainless steel fittings because it resists calcification and mineralization. Includes PVC/Stainless Steel float-valve, stainless steel chain and arm, and poly float. We will install the 1″ threaded fitting in any location at no charge. A good location is about 6″ down into the base (24″ off the bottom). This makes it easy to access the valve and doesn’t require burying the line 30″ deep. If you are in an area that has hard freezes in winter, you may need to take precautions to prevent damage to the float valve. Without a float-valve, the guzzler itself will withstand hard freezes just fine. Collection roof systems can be built in various sizes and configurations. 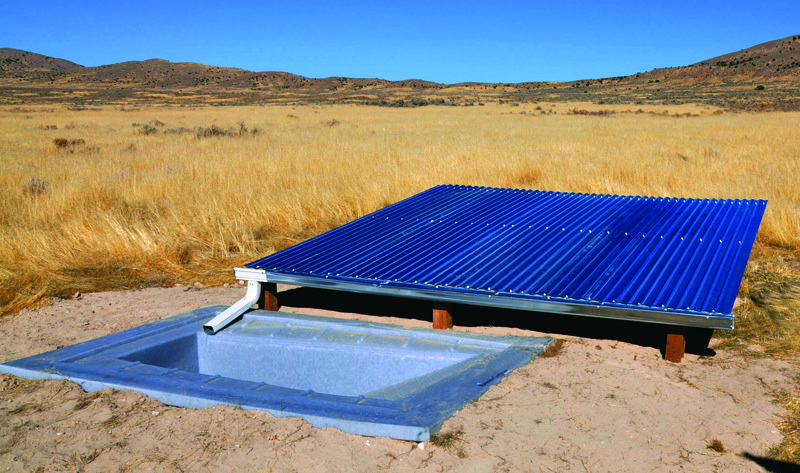 Read about roof collectors suitable for all guzzlers.